Pedaling into Downtown Raleigh with Citrix Cycle! 6 years ago, Citrix made an impactful decision to grow our presence in Raleigh and to do it in Downtown Raleigh’s Warehouse District, an area that had seen declining investment for many years. Bringing hundreds of employees into 170,000 square feet of modern, inspirational workspace had an immediate and lasting positive impact on the neighborhood and downtown as a whole. In that same spirit of growth and commitment to our community, Citrix is proud take our community engagement to the next level as the title sponsor for Citrix Cycle, Raleigh’s dock-based bikeshare program. In a collaborative effort with both the City of Raleigh and Bewegen Technologies, Inc., Citrix is leveraging our products and technologies to drive innovation in bikeshare as well as the City of Raleigh. We’re part of a vibrant urban fabric, and supporting bikeshare was an easy choice for Citrix as we work to power a world where people can be connected to their digital spaces and their physical spaces with ease. Citrix Cycle will create new mobility opportunities for residents, visitors, and employees, while reducing carbon footprints and increasing options for physical activity. Citrix Cycle is expected to launch this fall, with 30 stations throughout the city center and 300 bikes for rent. Citrix Cycle will offer discounts for students and qualified residents. Standard pricing will be $2 for a one-way trip, $6 for a daily pass, $20 for a monthly membership, and $85 for an annual membership (memberships include unlimited 45-minute trips). Citrix Cycle has also been fun for our employees as we were able to utilize local talent for the design of the bikes and the docking stations, giving them a distinctly “Raleigh” feel. Employees and their families will also have access to free and discounted annual memberships, as well as single rides. In the future, Citrix employees will have the chance to volunteer with Corps Logistics, the veteran-owned and run bikeshare operations group. 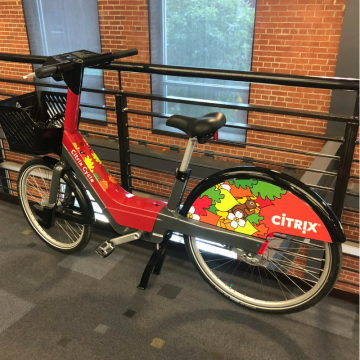 Look for Citrix Cycle at festivals and events around Downtown Raleigh and see the bike for yourself starting August 15that the Downtown Raleigh Alliance’s Market on Market event. Stay up to date by following us on Twitter @CitrixCycle, too. Count down to Christmas, Summit and Synergy with an IoT tree ornament!